Fly By Midnight is the second exciting story of the Mayhem sisters, Vivi, Honora, and Clover, and thanks to an old family curse, trouble is never far away. In the witching world of Everland, Stargazer City is pulsing with magical energy and that's just the way a natural-born flyer like Honora Mayhem likes it. When one of the most important wizards in Everland goes missing, the youngest Mayhem Sister, who happens to be one of the witching world's up-and-coming young private investigators, is hot on the case. With help from her flying club, a rival PI, and her trusted assistant, Honora digs up some promising clues—unsettling questions—about the wizard's disappearance. Why did the police dismiss the case so quickly, and why is Honora getting the runaround from the Witch Council? After a nasty encounter with a Hex Division agent in the city's magic district, she fears the council maybe working against her on a case that suddenly seems to concern something far more serious than one missing wizard. In a dogged attempt at discovering the truth, Honora travels to the fabled North Woods where she meets a handsome ax-wielding tracker who guides her deep into the icy wilderness, home to rogue wildlife and practitioners or powerful and secretive magic. What Honora discovers is a devious force from the Otherworld whose ambitions endanger the entire witching world. Besides her own wits and stubbornness, Honora must rely on her sisters for strength and guidance, not to mention Vivi's potion-making skills, to fight a dark evil and return order to Everland, so she can fly by midnight in peace. 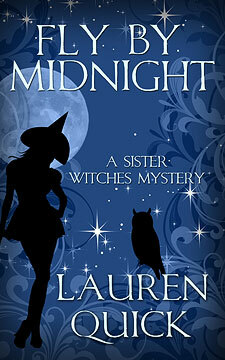 Brimming with magic, mayhem, and a trio of cunning sister witches, Fly By Midnight is a paranormal mystery with twists and turns you won't see coming.